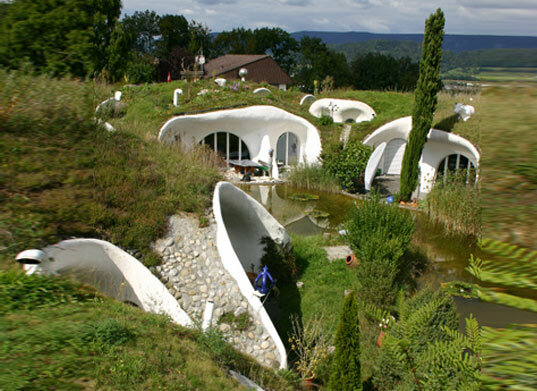 We're really into buried homes here at Inhabitat - from this crazy flower-shaped one in Britain to these 700 year old hobbit houses in Iran, we've scoured the globe looking for the coolest ones. 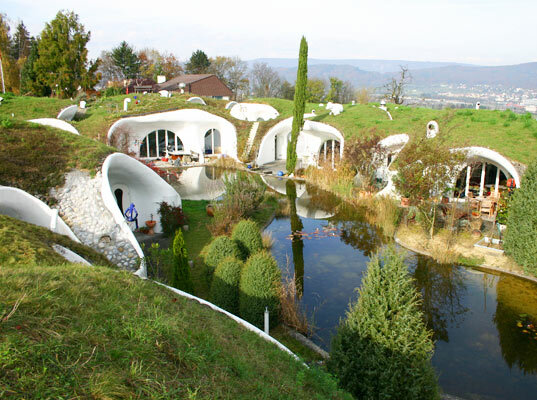 So you can imagine how we felt when we stumbled upon this delightful hidden gem by Vetsch Architektur. Made of concrete and earth, the Swiss estate is actually a cluster of grass-blanketed houses encircling a pretty little lake. Aside from using natural and recycled materials and having a green roof, the structure was built using typical earth house construction, resulting in an insulating blanket that protects it from rain, low temperatures, wind and natural abrasion. The estate is actually quite spacious and consists of nine houses – three 3 bedroom, a 4 bedroom, a 5 bedroom, three 6 bedroom and one 7 bedroom – clustered around a lake. In order to maximize daylighting, the areas which would be used most during the day are situated towards the south, and the nighttime areas towards the north. Bathrooms and stairs to the basement sit between the two and all of the bathrooms get natural light via skylights. While the basement and parking lot (yes there is a subterranean parking lot) were built using conventional methods, the entire ground floor was constructed using the typical earth home sprayed concrete technique. The house also makes use of recycled glass and is topped with a protective green roof which can be used to grow grass or even edible plants. How do structures like these fare in earthquakes? And no problems with bug entering the house? That's my first thought on an underground house. The estate is actually quite spacious and consists of nine houses - three 3 bedroom, a 4 bedroom, a 5 bedroom, three 6 bedroom and one 7 bedroom - clustered around a lake. In order to maximize daylighting, the areas which would be used most during the day are situated towards the south, and the nighttime areas towards the north. Bathrooms and stairs to the basement sit between the two and all of the bathrooms get natural light via skylights. The basement and parking lot (yes there is a subterranean parking lot) were built using conventional methods. The entire ground floor was constructed using the typical earth home sprayed concrete technique. The house also makes use of recycled glass and is topped with a protective green roof which can be used to grow grass or even edible plants.